San Elizario is located at (31.582873, -106.265703), right next to the river. As of the census of 2000, 11,046 people, 2,624 households, and 2,440 families resided in the CDP. The population density was 1,112.8 people per square mile (429.5/km²). There were 2,809 housing units at an average density of 283.0/sq mi (109.2/km²). The racial makeup of the CDP was 94.34% White, 0.15% African American, 5.55% Native American, 0.01% Asian, 0.01% Pacific Islander, 4.18% from other races, and 0.76% from two or more races. Hispanics or Latinos of any race were 97.88% of the population. 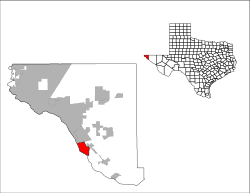 Of those 98.88% who identify themselves as Hispanic, 95.02% identify themselves as Mexican, making San Elizario the most Mexican (though not Hispanic, see Mila Doce, Texas) town in the United States. Of the 2,624 households, 67.3% had children under the age of 18 living with them, 73.8% were married couples living together, 15.2% had a female householder with no husband present, and 7.0% were not families. About 6.3% of all households were made up of individuals, and 2.1% had someone living alone who was 65 years of age or older. The average household size was 4.21 and the average family size was 4.40. In the CDP, the population was distributed as 42.3% under the age of 18, 11.0% from 18 to 24, 28.6% from 25 to 44, 13.4% from 45 to 64, and 4.7% who were 65 years of age or older. The median age was 22 years. For every 100 females, there were 99.4 males. For every 100 females age 18 and over, there were 94.4 males. The median income for a household in the CDP was $20,145, and for a family was $20,772. Males had a median income of $16,689 versus $12,648 for females. The per capita income for the CDP was $5,915. About 40.2% of families and 44.5% of the population were below the poverty line, including 51.8% of those under age 18 and 20.3% of those age 65 or over. In 1598, Don Juan de Oñate, a Spanish nobleman and conquistador born in Zacatecas, Mexico, led a group of 539 colonists and 7,000 head of livestock (including horses, oxen, and cattle) from southern Chihuahua to settle the province of New Mexico. The caravan traveled a northeasterly route for weeks across the desert until it reached the banks of the Rio Grande in the San Elizario area. A mass was held, a blessing of the standard and a celebration. Oñate performed the ceremony of La Toma ("Taking Possession"), in which he claimed the new province for King Philip II of Spain. This is considered to be the "Birth of the American Southwest". San Elizario Chapel (La Capilla de San Elcear) was never a mission, but it functioned as a presidio chapel. It provided the religious needs of a presidio or outpost of military personnel. The presidio was moved to the present site in 1789, to protect travelers and settlers along the Camino Real (Royal Highway) which ran from Mexico City through Ciudad Juárez, then called "Paso del Norte", to Santa Fe, New Mexico. Its close proximity to the Ysleta and Socorro missions also provided protection for them. When Mexico became independent from Spain in 1821, the military presence at the presidio decreased. By 1848, the presidio had fallen into ruins. Rebuilding efforts began in 1853, with a small church. This proved inadequate, and the present structure was completed in 1882. The exterior appearance has changed very little since then. The wedding scene for the movie Fandango (1985) was filmed in the plaza of the San Elizario church. In 1877, a conflict, the Salt War, broke out between the town and a troop of Texas Rangers. The Rangers surrendered. San Elizario, Texas Facts for Kids. Kiddle Encyclopedia.